Leak Sealer is a concentrated formulation to seal minor leaks in spas and hot tubs. It can be used for leaks in either the shell and/or internal plumbing system. What is Spa Care™ Leak Sealer? Spa Care™ Leak Sealer is a compound that has been developed to help seal minor cracks and leaks in swimming pools. A leaking pool is every pool owner's nightmare. Lo-Chlor has developed an easy way to plug minor leaks. Leak Sealer has a very high pH (about 12) so when you add it, it takes on the pH (between 7.0 and 8.0). It now no longer functions as a liquid and starts to solidify in the presence of oxygen at the site of the leak. To ensure best results, please follow the instructions on the label. Leak Sealer is sold in more than 25 countries around the world. Leak Sealer is the fastest selling and most popular specialty pool and spa chemical in Spain and France. Lo-Chlor Chemicals distributes more than 20,000L a year of Leak Sealer to all corners of the globe. 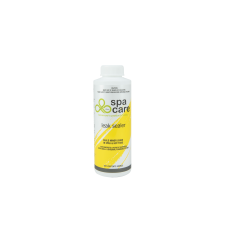 Spa Care™ Leak Sealer should be added in accordance with the directions given.